I have been meditating on this teaching for several years now, and I believe the Lord wants me to share it in a much bigger way than I have before. It's about living in God's best. The Lord has really impressed on me that the main reason we aren't living in His best is because we are willing to settle for less. Sometimes we are influenced more by the world than by God's Word. We have been "dumbed down" to accept far less than what God has provided. As long as we can live with less than God's best, we will. If you're not experiencing His best, you have to get sick and tired of being sick and tired. You have to have a holy dissatisfaction with mediocrity before you can experience all that God has for you. It doesn't happen accidentally or automatically. If you don't aggressively pursue it, you won't get it. Everything in our fallen world naturally goes from good to bad. Things don't get better without effort. We have to seek to find, knock to get the door opened, and ask before we receive (Matt. 7:7). We must raise our sights and aim higher. Most people are shooting at nothing and hitting it every time. Jeremiah 29:11 says, "I know the thoughts that I think toward you, saith the Lord, thoughts of peace, and not of evil, to give you an expected end." The New International Version says His thoughts "give you hope and a future." When the Lord spoke to Jeremiah to write these words, Israel was devastated. The city of Jerusalem had been destroyed, and many people had been taken captive to Babylon. Thoughts of peace were probably the last thing on their minds. I've had people tell me they prayed and believed God, but nothing happened. These scriptures in Jeremiah promise otherwise. The key is, you have to seek with ALL your heart. That's the missing element. 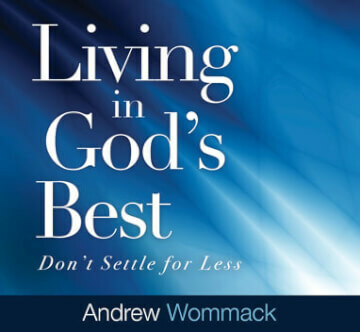 You have to reach a point where you won't live with anything less than God's best. This attitude is missing in the lives of far too many Christians. The bar of expectation has been lowered in regards to healing, finances, and more. I am not trying to condemn anyone. We have all been raised in and influenced by an ungodly culture. And nobody learns how to receive God's best overnight. It's a process, but we need to begin moving in that direction. I haven't arrived there either, but I have left and am on my way. I have told this story before, but it is such a good illustration that I want to share it again. A man asked for prayer in one of my meetings and told me about a terrible pain in his neck, in addition to a long list of other problems: his sciatic nerve causing leg and foot pain, neuropathy, and on and on. Then he said, "But if God could just heal the pain in my neck, I could live with the rest." I said, "Well, I understand. If we asked God to heal all of those things at once, the lights in heaven might dim. I'm not sure God could pull that off." The guy just looked at me for a minute and then replied, "That was pretty stupid, wasn't it?" And I agreed. You see, we don't have to settle for less than complete healing - God's best. Like this man, it's that attitude that keeps people from receiving their healings. Christians should be walking in supernatural healing and financial prosperity. Many, however, are just as sick and broke as their unsaved neighbors. You will never receive God's best until you become completely dissatisfied with second best - dissatisfied with mediocrity. One of these days, we are all going to stand before God. And when we do, we will know all things even as we are known (1 Cor. 13:12). In an instant, we are going to know what we could have had while on this earth. We will understand that the same power that raised Christ from the dead was present within us all along (Eph. 1:18-20). Unless you're willing to stand and fight the fight of faith, you will be overcome by this world. If you don't stir yourself up, you will settle to the bottom. The world isn't going to encourage you toward God's best, and most Christians aren't either. We have to recognize that it's all about receiving what God has already done and not about getting God to do something He has yet to do. We don't need God to heal us; by His stripes, we were healed (1 Pet. 2:24). That miraculous healing power is already in us. We don't need God to move; we need to believe what He has already done and then learn how to receive it. I want to encourage you to live in God's best. I've written a new book filled with truths that can change the results you're seeing in your life. For information on how to get your copy, go to www.awme.net/godsbest. Also, if you're interested in getting a hold of the accompanying CD or DVD teaching, see the response card or call our Helpline: +44 (0)1922 473300. Get ready to live in God's best!